Personal injury cases run the gamut from slip-and-fall accidents to auto wrecks. Insurance companies are often involved, and most parties generally want to resolve cases as economically as possible. Mediation is one option to accomplish this. Mediation is a form of alternate dispute resolution (ADR), in which the parties voluntarily agree to work with an independent third party – a mediator – to resolve their disputes. Unlike a court trial where one party is the “winner” and the other party is the “loser,” mediation involves finding a workable solution to which all parties can agree. A mediated settlement is formalized with a legally binding contract signed by all parties. Mediation is a non-binding procedure, meaning that no party can be forced to consent to an agreement. The mediator does not have the decision-making authority that a jury, judge or arbitrator has. Even if the parties previously agreed to mediate their dispute, any party is free to walk away from the process and pursue the matter in the courts. Mediation also affords the parties a level of confidentiality that is not available in court cases. Parties cannot be forced to disclose information. If a party opts to make admissions or disclose confidential information, those statements or information cannot be introduced in court or otherwise used outside the scope of the mediation itself. 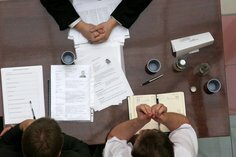 This confidentiality enables the parties to freely and productively negotiate their dispute. Unlike court trials or arbitration hearings, which are determined based on the underlying facts of the incident and the applicable laws, mediation allows parties to make agreements based on their own interests. The parties are free to allow their choices to be guided by business interests or personal preferences. When the dialogue within a mediation is focused on each party’s true interests, a mutually satisfying result is often possible. Parties to a personal injury dispute often choose to mediate the case to avoid a trial involving significant attorney’s fees and other costs and an uncertain outcome. When both sides are faced with uncertainties regarding the outcome, a mediated settlement agreement can be a good solution. Furthermore, taking a case to trial can take months or years and usually results in at least one party being unhappy with the outcome. In mediating a personal injury case, the parties and their lawyers work with the mediator to devise a settlement that everyone can live with. Plaintiffs can be compensated for their property damage, medical costs, lost income, and pain and suffering. On the other hand, defendants and their insurance companies can end up paying far less than it would have spent in legal fees and costs to defend the case at trial, and a potential sizable jury award. A good mediator will help all parties see the strengths and weaknesses in their respective cases, enabling them to compromise and arrive at a result which is acceptable to both.